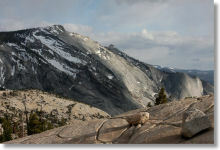 Why hike to Clouds Rest? To take in one of Yosemite's most stunning and wide-ranging 360-degree panoramic views, stretching from Hawaii in the west to Nebraska in the east. Or thereabouts. You can definitely see a lot of stuff from here. Best Time to Visit: As with any trails off the Tioga Road, the road itself needs to be open (June through October, roughly). For safety reasons, it's probably best avoided when you can spot snow on top of the mountain or when there are thunderstorms in the area. Low-flying clouds of any variety, for that matter, can envelop you and muck up the views; it's not for nothing that Clouds Rest got its name. Crowd Factor: A seven-mile hike will weed out a lot of people, and the unnervingly narrow trail along the ridge will take care of lots more. That there will probably still be people at the top when you get there is a testament to just how good the views are. Difficulty: Strenuous, but not in the Half Dome category (speaking of strenuous, bring binoculars and you can watch hikers making their way up the Half Dome cables from here). An 8 out of 10. The most difficult part, unless you're afraid of heights, will be a thousand-foot-gaining series of switchbacks about a mile and a half into the hike. Scenery Summary: This hike is all about the destination, from which you'll have striking views in every direction, including, perhaps most gripping of all, straight down. Turn a complete circle and you'll be able to see any number of Yosemite landmarks, including Tenaya Lake, Half Dome, Mt. Hoffman, Sentinel Dome, North Dome, and bits of Cathedral Rocks and El Capitan, plus Merced Lake and dozens of peaks you probably won't be able to name. Parking: A lot at the trailhead holds a dozen or so cars. It will be full. Look for spots along the shoulders of the road; you shouldn't have to wander too far to find an opening. One temptingly empty area just across the road from the parking lot is signed as a no-parking zone just to see if you're paying attention. Nearest Bathrooms: Pit toilet at the trailhead. You can find bathrooms with plumbing at the Tuolumne Meadows Visitor Center, 5 miles (8 km) east. Nearest Snacks: The bear-proof lockers at the trailhead will probably contain an intriguing variety of food and drink. Unimpeachable person that you are, though, you'll prefer to visit the Tuolumne Meadows Grill & Store, 5 miles (8 km) east, and purchase your own refreshments. Getting There: The trailhead is off Tioga Road at the west end of Tenaya Lake - watch for the "Sunrise" signs. It's 31 miles (50 km) from the Tioga Road's western end point at Crane Flat, and 16 miles (25 km) from Yosemite's eastern entrance at Tioga Pass. Here's a Google Street View panorama of the trailhead parking area. Acrophobics Beware: The top of Clouds Rest is a narrow ridge with a long, sheer dropoff on the north side (the side you can see from the Tioga Road). The dropoff to the south is less extreme, but it wouldn't require special talent to wind up just as thoroughly and symmetrically dead by falling off that side. 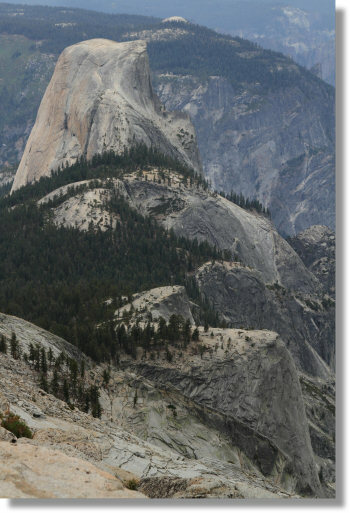 It's best to visit Clouds Rest sober and during dry weather. That said, the route over the ridge is more manageable and less dangerous than Half Dome's cable route. If you're slow and careful, you shouldn't feel like you're a freak gust of wind or a momentary lapse of concentration away from the bottom of Tenaya Canyon. And the very top of the peak opens up again to around fifty feet wide, which will feel like the Great Plains after the underpants-imperiling knife edge you've just crossed to get there. More Trail Notes & Hazards: There are two water hazards to overcome in the first mile or so of the hike. The most troublesome will be the Tenaya Lake outlet, which lies just a few steps from the trailhead. By mid summer you can usually rock-hop across, and by late summer it will probably be dried up altogether, but in the spring, you'll have to ford it. There's usually not much current, but the water can be thigh-high or more. The section of trail that climbs to the Sunrise Lakes fork is not just steep, but rocky, composed largely of ankle-gnawing riprap, and can be as fatiguing on the legs going down as it is on the lungs going up. The elevation of Clouds Rest (9,926 feet) means that sunscreen is especially recommended, and mosquito repellent also probably wouldn't go amiss. Cell phone reception is spotty along the Tioga Road, but you'll probably be able to make calls from the top of Clouds Rest itself. Forks in the Trail: Once you get past Tenaya Lake, you'll pass two forks en route to the summit. Turn right at both of them. If you turn left at the first one, about 2.5 miles along (it's marked in blue on the trail map), you'll be on the Sunrise Lakes trail. If you turn left at the second one, a bit over two miles shy of the summit, you'll eventually reach the John Muir Trail, which leads west to Little Yosemite Valley and northeast towards the Cathedral Lakes. Elevation Profile: Elevation-wise, Clouds Rest is a four-part trail shaped like a staircase, albeit one built by a contractor who was paid in tequila. Part one is a gentle, nearly flat walk of just under two miles through the Tenaya Lake valley. Part two is a tortuous series of switchbacks covering a thousand feet of elevation gain in a mile, leading at the summit to the Sunrise Lakes trail fork. After a brief descent, you'll have a leisurely stroll for a few miles through another wooded valley, passing a pretty pond along the way, until you begin climbing Clouds Rest itself. This final section isn't as steep as the first big hill you climbed, but its 9,000+ foot elevation will still take a toll. 1) Start from the Happy Isles trailhead (the main Half Dome trailhead). It's a 20 mile (32 km) round trip from the valley floor with just under 6,000 feet of elevation gain - a thousand feet more than the extremely strenuous Half Dome trail. You'd think that after a 6,000-foot descent, your knees would never talk to you again, but in fact they'll probably be noisier than ever. 2) Start from Glacier Point. This one's a 24 mile (38 km) round trip. The trailhead-to-summit elevation difference is only 2,700 feet, but this trail also involves a descent to Illilouette Fall and another to the top of Nevada Fall, so the net elevation gain is actually around 4,000 feet. 3) Start from the the Little Yosemite Valley backpackers' campground. This is the most manageable route from the west, at just under 12 miles (19 km) round trip with a 3,800 foot elevation gain - slightly shorter than the conventional Tioga Road route but about double the elevation gain. You'll need a wilderness permit to stay in the Little Yosemite Valley campground. For any of these routes, proceed as if you're on your way to Half Dome. Two miles from the summit, you'll reach a signed trail fork. The left fork continues to the top of Half Dome; the right one proceeds another 4.3 miles to Clouds Rest (you'll also need to turn left at another fork half a mile farther along). One Last Alternate Route: If you can arrange transportation, you can hike 17 miles (27 km) one way from Tenaya Lake up and over Clouds Rest and down to Yosemite Valley via the Half Dome trail. You'll climb 1,800 feet to the Clouds Rest summit and then descend nearly 6,000 feet to the valley floor. Happily enough, Yosemite Valley is also where the park's medical clinic is located.